Is there an ideal world and a real world? I think Plato was big on advocating for the existence of that duality. Most religions seem rooted in the notion, too, painting human beings as diminished versions of sacred ideals, or even of existence itself as a faint, corrupted echo of the purified afterlife. The most influential modern secular belief system, psychology, also seems to feed into the notion of reality as a dualistic conflict between what is and what could be, the core message being that every human has a “diagnosis” and is thus separated from an ideal state by deeply embedded flaws. Even capitalism, that most materialistic of human systems, uses as essential fuel the concept that there is a perpetual gnawing gap between the real and the ideal, between what you have and what you need. The ideal exists, forever out of reach. The Topps version of the 1978 Atlanta Braves differed from the actual 1978 Atlanta Braves, as evidenced here in Willie Montanez’ 1978 card. 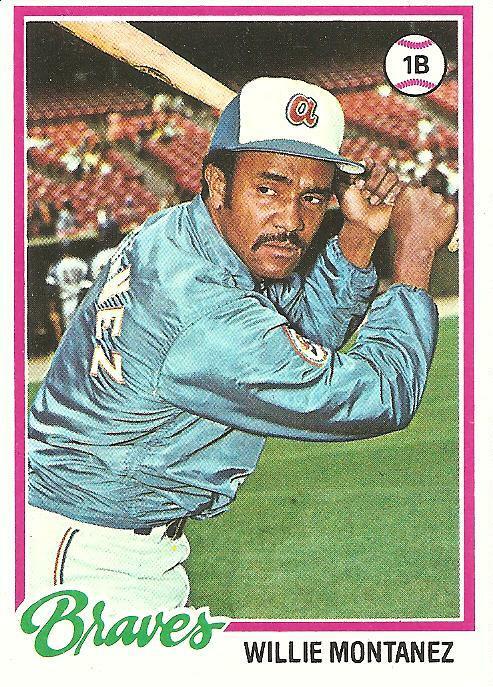 In that ideal world of the cardboard gods, a world that for a moment is pure speculation of what might be before rapidly migrating to the realm of what could have been, Willie Montanez was a member of the 1978 Atlanta Braves. In the real world, Willie Montanez never spent a moment with the 1978 Braves. With Montanez in 1977, the Braves had lost 101 games; without him in 1978, they lost 93. Meanwhile, Montanez’ addition to the Mets in 1978 cut that team’s 1977 loss total of 98 to a 1978 mark of 96. This is the funny thing about wondering what could have been. Really, the question is moot. No matter where you go or what you do, you’ll lose. But when you’re a kid, you live for a little while in an ideal world, having not yet absorbed the fundamental inevitabilities. When I was a kid I vowed to remember what it was like to be a kid, because it seemed to me that adults had allowed themselves to let go of that ideal world. I would, I vowed, hold on to that little kid mind forever. Despite this vow, despite—or perhaps in part because—of the exhausting attention I have paid, through twenty-plus years of writing, to the exploration of my memories, my little kid world slipped from my grasp. I got old, timid, worried, grim. If little kid Me met me now, the little kid Me would find old Me to be just the kind of stiff, awkward, hesitant adult who inspired the vow to remember what it was like to be a kid in the first place. I must have seen Willie Montanez play in the 1977 All-Star game, but the memory didn’t stick, maybe because on such a big night (and the All-Star game was always the biggest night of the summer for me) I didn’t need Willie Montanez. But the next season, when his ideal world version locked him into an apprehensive hunch as an Atlanta Brave, Topps card number 38, I watched him play for the 1978 Mets during my yearly visit to New York to see my dad. He stood out, did Willie Montanez the Met, despite or even because of all the losing, flipping his bat before each of his at-bats and snapping his glove when he made catches at first and in all other ways investing the mundane grownup world of routines and rituals with an unsinkable flair. Adults disparaged his actions on the field, scorning him as a “hot dog,” but kids always loved him wherever he went. He had somehow held onto a version of the game that we recognized, that we were most drawn to, that we needed: All is not lost. You are currently browsing the archives for the Willie Montanez category.